"Enjoy retro N64 games, but can’t stand the controller? That’s the situation I found myself in about 7 years ago, back in 2004. 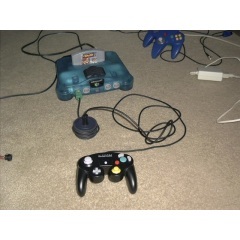 So I built an adaptor, to use Game Cube controllers on the N64." Thank you so much with regard to giving me personally an update on this topic on your web-site. Please be aware that if a brand-new post becomes available or if perhaps any variations occur on the current posting, I would want to consider reading more and knowing how to make good usage of those approaches you reveal. Thanks for your time and consideration of others by making this web site available. Hey, you used to write wonderful, but the last few posts have been kinda boringÂ¡K I miss your great writings. Past several posts are just a little bit out of track! come on! Think one can ream that cylinder a little and load 45-70?And yea, I don't think Taurus is stupid, or have jumped the shark… I think they're brilliant, and laughing all the way to the bank.But they do owe Larry some royalties. From Globe and Mail:So many investors are looking for a sign U.S. home prices are no longer falling that it might not take much to spark a rise in the beleaguered housing sector. The problem is that there is little reason to be optimistic.The S&P/Case-Shiller 20 largest cities index is due out today and it is expected to show home prices have plunged 16 per cent on a year-over-year basis during May, compared with a 15.3-per-cent drop during April, according to a survey of economists by Bloomberg.